Interactive gloves made it back into our headlines. We have covered recently the more simpler but yet very useful, I might even say essential touch screen gloves without which we are running around with frozen fingers or with our inability to receive even something simple like a cell phone call. Designer William Mazuel envisions a much smarter glove, a glove the contains a two-way radio and a digital audio player. 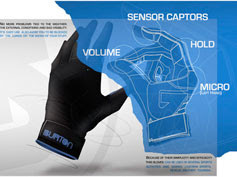 The gloves are not only a two-way radio and MP3 player, they also control those function via gestures. 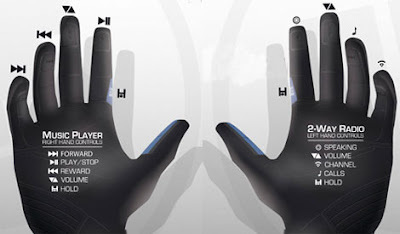 We have seen very smart glove concept designs in the past but William combines all the smartness into one and the same glove including the user interaction with the communication and entertainment function. As we are not so sure right now where the target market could be for such a very smart glove, mountain rescue might be interested into a hands-free communication device but does a smart glove qualify to be called hands-free?